The Ultimate Convergence of Sun, Sand, Clear Waters and Scintillating Fun! Aruba, an island just 27 km north of Venezuela is one of the constituent countries of the kingdom of the Netherlands. Known for its pristine natural beaches and clean cities, this island is constantly rated as one of the world’s best island getaways. You will love the typical European flavor and the hospitable local population who enjoy high standards of living. Getting to Aruba is a breeze! Aruba Airport (IATA Code: AUA) also known as the Queen Beatrix International Airport lies just outside the capital city of Oranjestad and is well connected to major cities in the USA, Canada, Venezuela, Netherlands and rest of Europe. Finding a car rental company or a taxi from the airport is fairly easy. This Island also has a very good air conditioned public bus transportation network called Arubus which is operated by the government of Aruba. While on your dream vacation you won’t have to worry about getting around! People from across the world head to Aruba for an unforgettable holiday. The island which is 21 miles long and 6 miles wide enjoys a tropical climate with an average yearly temperature of 82 degree Fahrenheit (28 degree C). The trade wind from the Atlantic gives this tropical destination an Isothermal effect and ensures that the temperature is never too hot. Since Aruba lies outside the hurricane belt in the Caribbean, annual rainfall rarely crosses 20 inches (approx 500 mm) giving the island year round tourists. This paradise never fails to impress! Aruba’s beaches have something for everyone. Whether you want to relax or go on an adventure, head to one of the many beaches in Aruba. While the beaches on the east and North West of Aruba are popular among surfers and kite boarders, the calmer waters of the beaches on the South Western side are ideal for swimming and relaxation. Snorkeling and water sports such as jet skiing are some of the other popular activities. You will also find very good restaurants and beach bars along most of the beaches. You can take your pick amongst some of these sun-kissed white sands- Palm beach, Eagle beach, Manchebo beach, Druif beach, Havana beach, Rogers beach and the Baby beach. As a top rated travel destination, this Island has some of the best hotels and resorts in the world. For the budget traveler, there are plenty of choices as well. Most of the hotels offer discounts on long stays. The party scene is very colorful and entertaining. Most hotels and resorts have live bands, discos and bars open late into the night. Casinos are the other big draw for tourists. 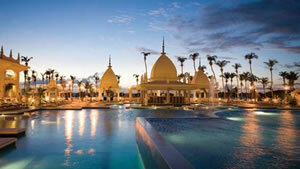 So if you’re feeling lucky, there’s no place like Aruba! You will probably be so mesmerized by the beauty of the beaches that you may forget that Aruba has a lot more to offer. Rent out an All Terrain Vehicle (ATV) or a mountain bike and explore the country’s rugged landscape and archaeological sites. There are plenty of museums for art and history lovers. For nature buffs, Aruba offers a myriad opportunities to spot beautiful and exotic birds. And… if you’re in love then a spicy salsa lesson together or a moon light cruise will be an unforgettable experience. Aruba is a perfect kaleidoscope of stunning beaches, beautiful nature, virgin terrain, adventure, rich history and unlimited fun. Come to Aruba and be ready to be enchanted by a world of smiling faces and amazing hospitality. We can help you explore this wonderland in all its brilliance.